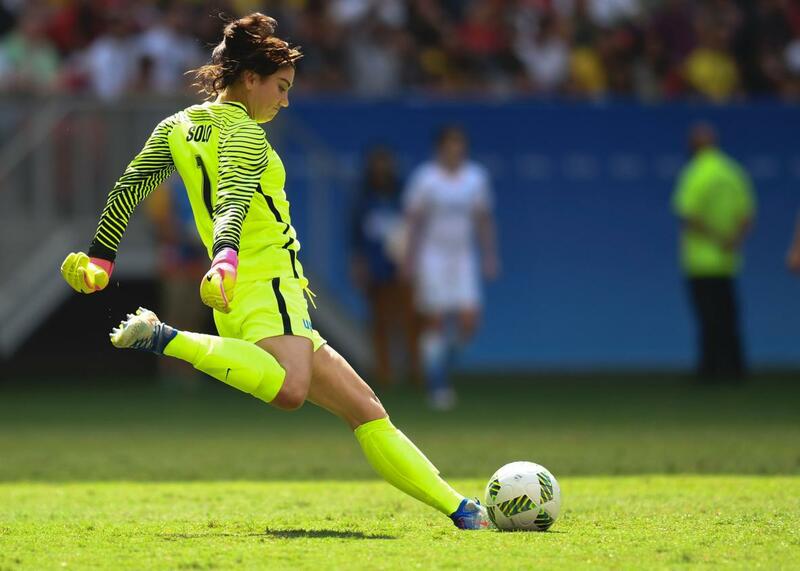 Goalkeeper Hope Solo kicks the ball during the U.S. women’s soccer team’s quarterfinal match against Sweden during the Rio de Janeiro 2016 Olympic Games at the Mane Garrincha Stadium in Brasilia. The U.S. women’s soccer team is the best in the world. The fact that they will not medal in the 2016 Rio de Janeiro Games does not change that. It doesn’t even mean they played poorly in Brazil. The national team looked vulnerable in the early stages of both the 2012 London Games and the 2015 World Cup in Canada and went on to win both tournaments. The United States’ loss to Sweden in the quarterfinals of this Olympics doesn’t suggest anything particularly dire about the state of the national team program. It just means they didn’t get all the breaks that had gone their way in winning the sport’s two most-recent major tournaments. There is one conclusion, however, that it is fair to draw from the last week in Brazil: The national team needs a new goalkeeper. On Thursday, the USWNT outshot Sweden 26 to 5 and dominated possession. But after a scoreless opening half, it was the Swedes who got the first goal. The forebodingly named Stina Blackstenius capitalized on a counterattack, splitting two U.S. defenders and finding the back of the net in the 61st minute. Alex Morgan answered 16 minutes later after corralling a lucky bounce off a Swedish defender’s face. Tied at 1–1, the game went to extra time, and Sweden, managed by former U.S. national team coach Pia Sundhage, hung on to send the game to a shootout. After missed penalties by Morgan and Christen Press and one save by the United States’ Hope Solo, Sweden’s Lisa Dahlkvist approached the penalty spot to attempt the game-winner. Before Dahlkvist could strike the ball, Solo ran off the field to change her gloves, an obvious ploy to ice her opponent. NBC’s color commentator Arlo White called the move “savvy.” Savvy? Maybe. Effective? No. Dahlkvist scored, and the U.S. women were handed their earliest exit from a major tournament in program history. It wasn’t Solo’s desperate glove-changing that should motivate the U.S. team to audition new goalkeepers. It was her tentative performance in goal throughout the Olympics and what she said after the USWNT got ousted. Later, she texted a more conciliatory statement to Sports Illustrated’s Grant Wahl. There’s also a long history and tradition of the U.S. national team giving Solo second, third, and eighth chances on account of her tremendous talent in the net. Calling her opponents a “bunch of cowards” is the kind of thing that Hope Solo does. She denigrated her teammate Briana Scurry after the U.S. lost in the 2007 World Cup and slammed former U.S. player Brandi Chastain for her relatively innocuous criticism of the USWNT during the 2012 Olympics. In 2014, Solo was charged with assaulting her half-sister and nephew; that case is still being adjudicated. A year later, she was suspended by the national team after her husband Jerramy Stevens was arrested for DUI while driving a U.S. Soccer van. Back in June, Cristiano Ronaldo got dinged for his arrogance in deriding Iceland’s “small mentality” after the tiny nation managed a draw against Portugal in the European Championships. The 35-year-old Solo might be as arrogant as Ronaldo. There was also a time not too long ago when she was nearly as valuable to her national team as the Portuguese superstar is to his. But those days are gone. Solo, who recently recorded the 100th shutout of her career, nevertheless looked shaky in the Olympics, especially in the United States’ game against Colombia, in which she gave up one especially soft goal. She’ll be nearly 38 when the next World Cup rolls around. It’s hard to imagine her being the stopper in the net that the U.S. needs in 2019. U.S. Soccer has always taken a pragmatic approach to the Solo problem: She helped the team win, so they kept her around. Now, those benefits and costs appear to have changed. After the recent departures of veteran players Abby Wambach, Shannon Boxx, Christie Rampone, and Lauren Holiday, the team is shifting toward younger players. In years past, the win-at-all-costs move was to keep Hope Solo on the roster. Now, if the U.S. wants to retake its place at the top of the soccer world, the most sensible move is to let her go.